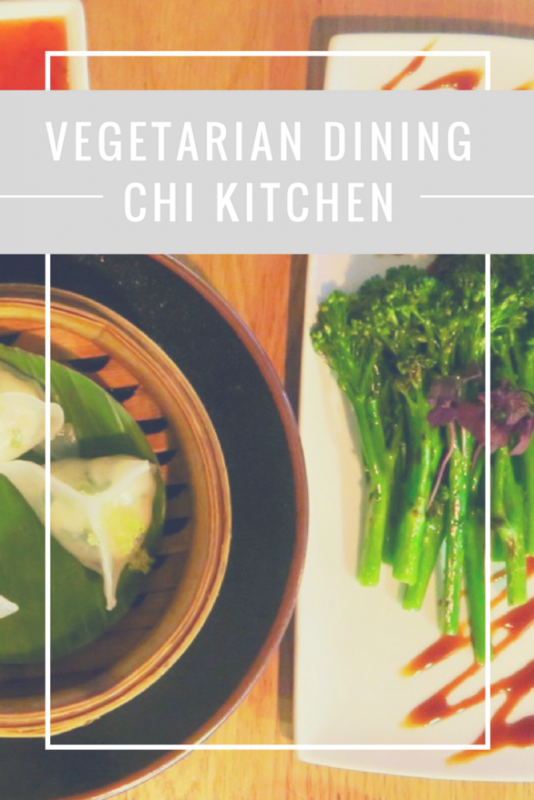 Having date night in a department store might seem like an odd choice even for me, but hidden at the back of the ground floor in Debenhams Oxford Street is Chi Kitchen a department store restaurant with a difference. 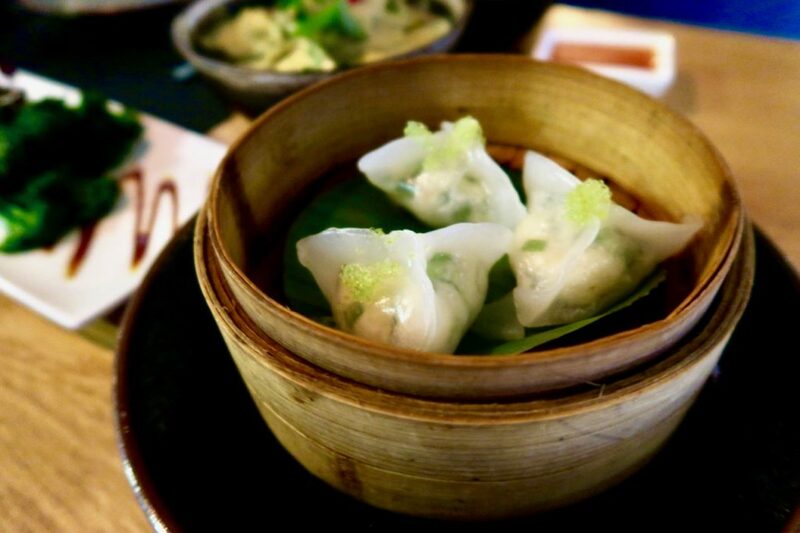 Serving up pan asian delights for breakfast, lunch, and dinner in inviting, open plan surroundings. Wandering around the back of Debenhams (as to avoid spending all my money at the Kat Von D counter), we spotted Chi Kitchen straight away with its branding splashed across the glass windows. As we walked up the stairs to the entrance a smartly dressed member of staff held the door open for us, automatically making Pablo and I feel very welcome. This friendly attitude continued and despite our reservation having gone missing it was not a problem, we were promptly sat at one of the modern turquoise booths. 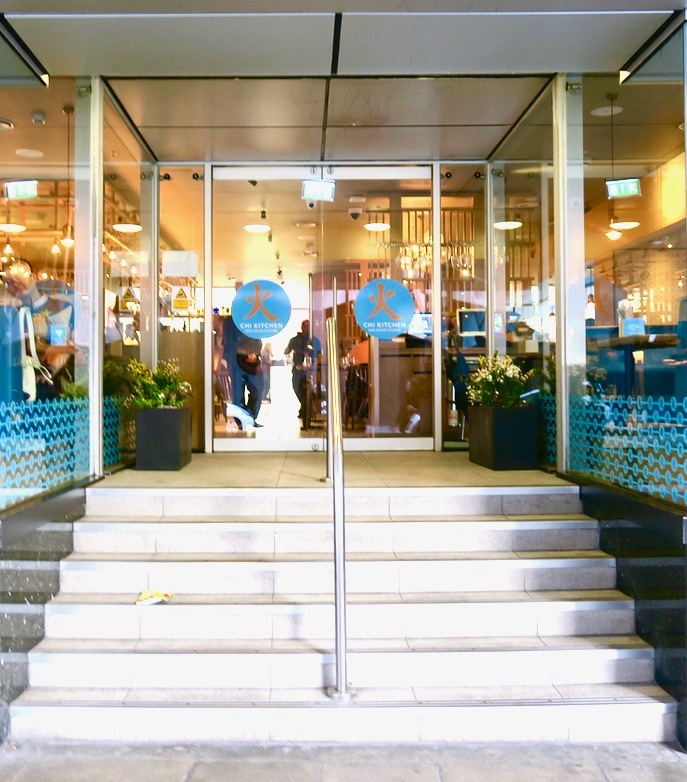 Typical department store restaurants are café style eateries with strip lighting, but not Chi Kitchen where the decor was elegant and modern. Taking their inspiration from the elements there was a mix of orange iridescent lighting, blue accents in the furniture, light wood and metal which came together beautifully to create a light yet comfortable atmosphere. 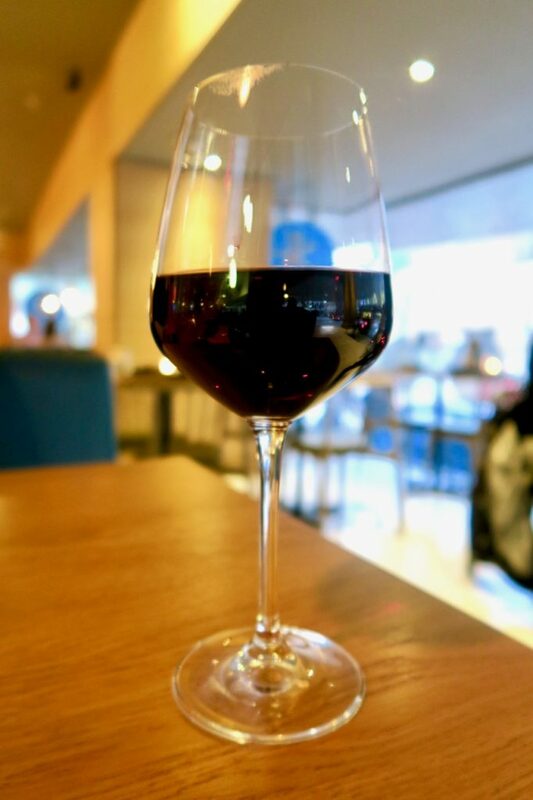 Pablo and I had had a hard week so we started with a glass of wine, which was a delicious, light Portuguese red. Feeling relaxed it was now time to properly browse the menu which offered up a wide selection including: sushi, dim sum, stir fry, robata bbq, and a variety of other rice and noodle dishes. I have recently gone dairy free so emailed ahead to ask if they had vegan options, so far I have found this the best approach as most places are super accommodating as long as they have advanced notice of dietary requirements. Although I had been disorganised and only emailed on the day of our visit I received a friendly email back with a helpful selection of vegan items that were available. On top of this the waiter talked me through the menu and assured me they could do whatever I wanted as everything is cooked fresh in their open kitchen. 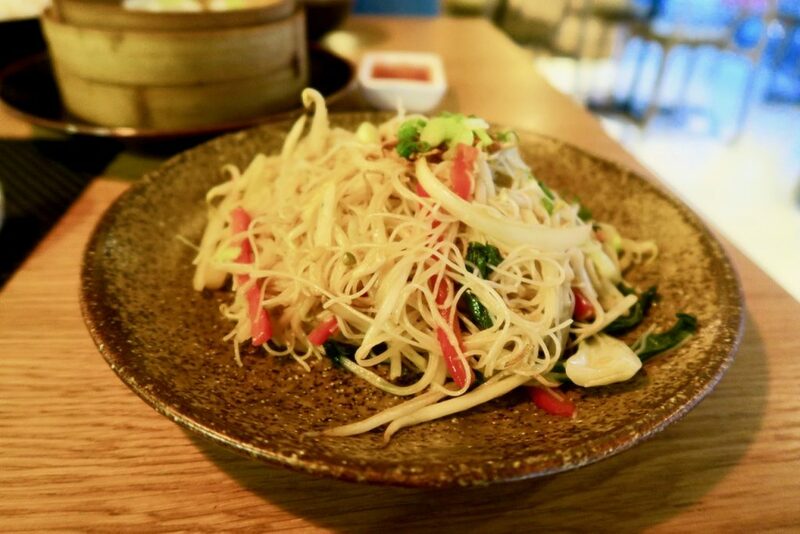 Sometimes, eating out when you don’t have a standard diet can be both awkward and restricting but Chi Kitchen made the experience a breeze. As the food is cooked fresh, everything is brought out as it is ready. 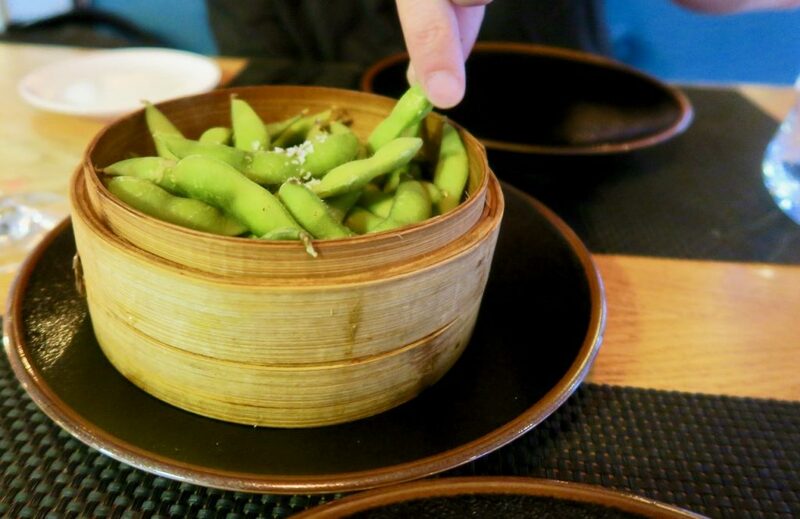 First up was edamame served quickly as not to over steam which made them the perfect balance of crunchy and warm. Soon the rest of the dishes were brought to us and our table was covered in culinary delights. Unfortunately fish sauce is used in lots of Asian dishes so Pablo and I couldn’t share as we usually would, but everything looked delicious. I ordered the Cha Bee Hoon without eggs or sambal sauce and a side of broccoli, because I love my greens. The broccoli was cooked just how I like it and had a firm, crisp, texture. 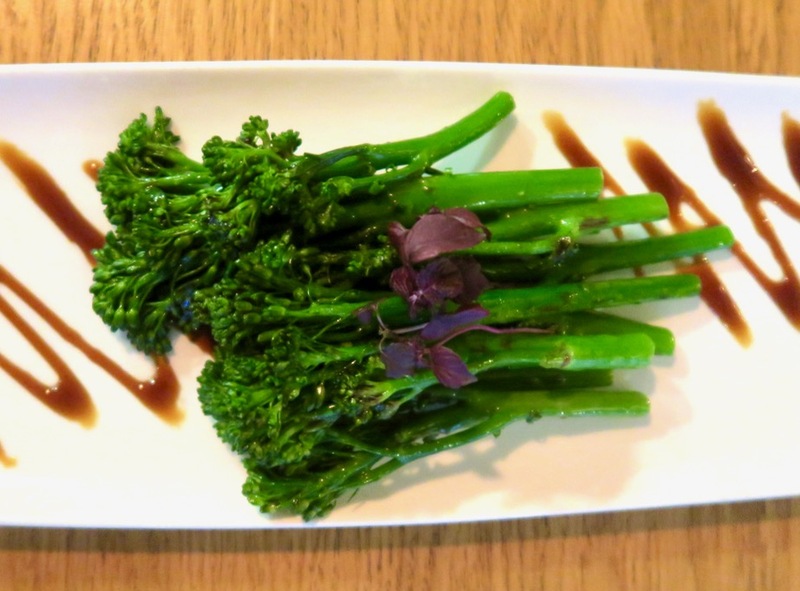 Its natural earthy flavour was complimented by a drizzle of soy sauce instead of their usual oyster sauce dressing. I piled this on top of my Cha Bee Hoon to add even more veg. This dish is a Singapore staple and one I have eaten many times whilst backpacking. The Chi Kitchen version was light with each delicate vermicelli noodle coated in just the right amount of teriyaki sauce. The veg was also fried just the right amount, adding warmth but also maintaining crunch, adding fresh flavour, texture, and colour to the dish. 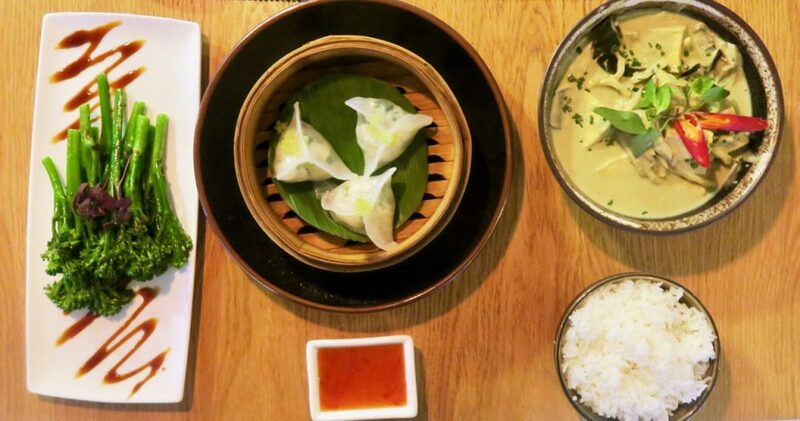 Pablo was also impressed by his selection of Tofu Thai Green Curry, Jasmine Rice and Dim Sum. The Dim Sum was brought to us in a bamboo steamer; just as with the edamame, as soon as it was dropped off at our table the lid was whipped off, adding a slightly theatrical element to our dining experience as well as stopping the little parcels from being over cooked. 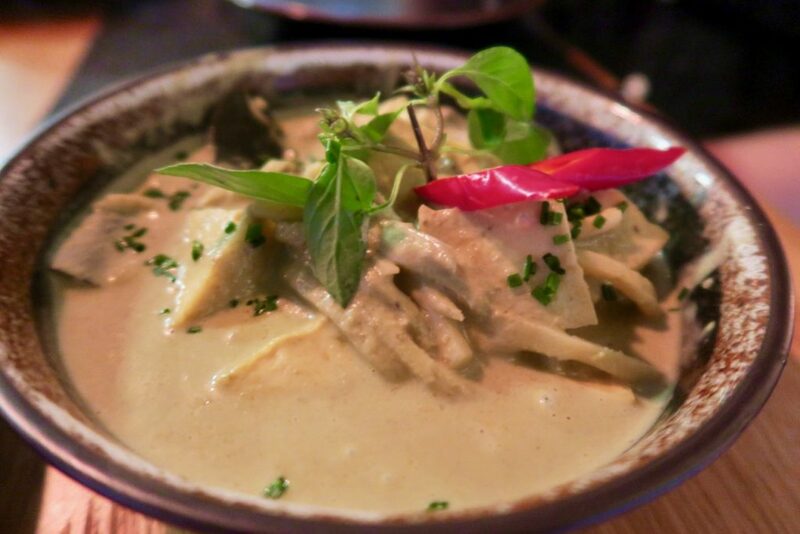 It was then onto the Thai Green Curry, another one of our backpacking favourites. The curry sauce was thicker than the traditional Thai version but the flavours remained authentic, complemented by a generous portion of vegetables and tofu. As we finished each plate a member of the waiting team appeared with the stealth of a ninja and removed it, which was incredibly attentive without being overbearing. Neither of us had room for dessert but did not feel rushed to leave and enjoyed catching up in the comfortable surroundings. As we left, all the staff (including the chefs) bid us adieu as we exited through the department store into the perfumery. 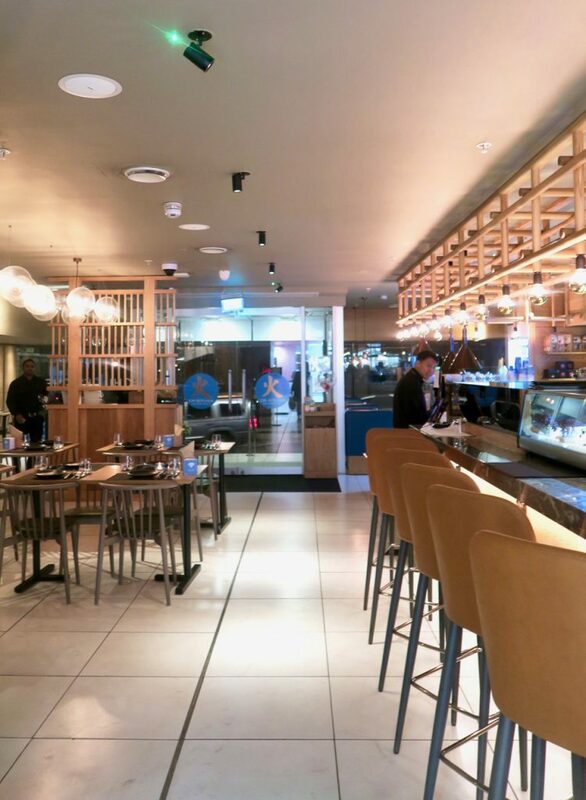 If you are shopping and need a high quality pit stop, or are just looking for somewhere new to check out in Central London, Chi Kitchen is the perfect place with gorgeous decor, relaxed atmosphere, fresh food and great staff. Oh Chi Kitchen <3 It's one of my faves! And I love that they were so accommodating! The staff sound lovely! And that food looks delicious! Maybe an unusual choice, but surely a great one. The interior, the food and the overall dining experience sound amazing, and it being so close to a great shopping destination only adds to my excitement. I still haven’t been here, despite working at Debenhams when it originally opened! I just have an aversion to that building now, so maybe I’ll visit a different outpost instead! Yum. You write about food so well, I can almost taste it! I am still yet to visit but have heard such great things!